Eating a mainly organic diet is really important to me. I’ve written on this blog before about why I think everyone should choose organic. It’s not just the benefits to our own health by avoiding the chemicals, but to animals, our planet, soil and water too. Chemicals are so destructive and we are a walking experiment for them. We have no idea of many of their long term effects as we are the long term case study! In this blog post today I want to share the reasons why I think organic fruit and vegetable boxes are great. It’s not just about choosing organic as there are many other reasons they are beneficial too. We’ve been getting organic boxes for a few years now. The first mention I can find on my other blog, Lylia Rose, of our Abel and Cole box was in April 2015. I’m not sure how soon before this we ordered the boxes, but we’ve definitely had them well over three and a half years, if not four years. We stopped for a short while when our local supermarket started stocking more organic produce, which was cheaper, but then I had a change of heart as I wanted to support more local farmers as well as reduce our packaging. Plus the veg from the boxes tasted so much nicer! I was ordering from Ocado at that point too so I went with their Wholegood organic boxes. These were great to start, but I then had a few in a row with rotting food. Carrots that only lasted a day and veg that just didn’t look or taste fresh. As it happened a few times I decided to change my organic box again. I’d heard good things about Riverford from a couple of friends so it was time to try them. We’ve now had three Riverford deliveries and I’ve been impressed every time. The food is so fresh and most of it lasts a week until the next delivery and some has even lasted well beyond one week. The driver is always pleasant and we get a reasonable amount of produce. Sure, it’s a little more expensive than buying the equivalent in a supermarket, but is it worth it? I think so. There are so many vegetables that aren’t available in our supermarket, we pass by or never think to purchase. We’ve been able to try so many different vegetables we haven’t heard of, even a few years into getting our boxes! We received tomatillos for the very first time last week! We now regularly eat fennel, pak choi, swiss chard, kohlrabi and all sorts of other vegetables we’d never have bought before. With Abel and Cole you can choose and change some items in your box and I was guilty of doing this. Now I just let whatever is in the box arrive. It’s much more exciting and means we have no idea what veg we’ll have for the week. There’s never anything we really detest and we just make sure we use everything up. It’s a great way to get a variety of veg every week instead of buying the same old things. Obviously the most convenient part is it’s delivered to your house each week as a subscription, but one you can cancel at any time. You can also pause when on holiday. When I’m not home they leave in my safe place. All the fruit and veg is organic so fingers crossed it is produced to strict organic standards using only natural fertilisers and pesticides, if any at all. I can’t see that there’s anything beneficial about the widespread use of chemicals in agriculture. It’s so destructive. Because it’s chemical free it means we are not ingesting these chemicals. It’s all very well washing non-organic produce, but this doesn’t ever get rid of all the toxins and poisons. Many are embedded deep in the skin and even in the produce itself. As non-organic produce doesn’t need to fight off attackers itself, it produces less antioxidants and so on, so less for us to consume. A study found that switching to organic food is the equivalent of eating an extra 1-2 potions of fruit a day in antioxidants. Not only does it stop us consuming chemicals, but the planet too. All these chemicals sprayed on crops end up in the soil and washed away in water, eventually affecting water supplies around the world. Organic farming supports and encourages wildlife. Many farmers who are organic wish to protect wildlife. Organic farming encourages more biodiversity and wild flowers that are often wiped out and no longer seen on conventional farms. If you care deeply about animal welfare, then you should care about organic farming. The food is fresh, usually! With my new supplier Riverford and old supplier Abel and Cole, all the produce is so fresh and super tasty. It looks fresh, tastes fresh and lasts a good while. It really does feel like it’s been plucked straight off the farm and not sat around in boxes and shelves for days on end. One massive bonus is the reduction of waste. Nearly all the food I order comes loose in a cardboard box. There’s minimal plastic and most of the plastic can be recycled. Riverford are aiming to ensure all their plastic can be recycled soon. The driver will take away the main boxes and they’ll be reuses several times before being recycled. We barely have any rubbish now. We refill our recycling bin once every two weeks, but our landfill bin only needs to go our once every six weeks! Most of the veg in our veg box supports UK farmers. Riverford and Abel and Cole even have a 100% UK seasonal veg box so nothing comes from abroad if preferred. It’s great to support our own local economy as much as possible. If you order a veg box each week then it will encourage you to eat healthily. Not only is all the produce so fresh and delicious, but if it’s there then it makes sense to eat it right? Fill your fridge and cupboards with veg that needs to be eaten rather than allowing processed junk to take up the space. 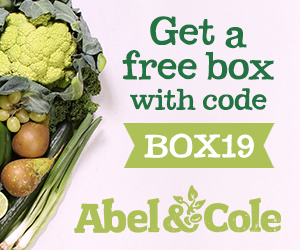 Click here to try out Abel and Cole organic boxes! Update 03.04.2019 – Since writing this I have gone back to Abel and Cole boxes. I had a few Riverford boxes, but started to dread them as I had to spend one hour scrubbing the muddy vegetables each time. The Abel and Cole produce arrives ready to put away or only slightly muddy or in need of a normal rinse. I was tempted back by one of their irresistible offers. They have such amazing offers. 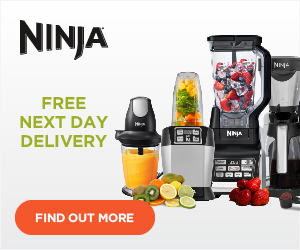 Check out the link at the top of my blog sidebar for a free box offer!